Visitor Management Systems For Schools – Make the right first impression with how your school manages its visitors. The traditional hand-written sign in books now have too many potential risks and scope for errors. With generic sticker labels for visitors and hand-written late slips for pupils and staff, there isn’t an easy way to analyse all this information. Safeguarding is an important protocol for schools to ensure the safety of pupils and the identity of staff and visitors. 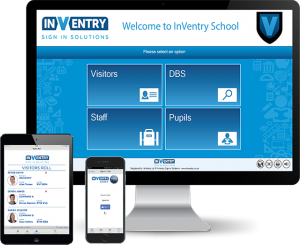 SchoolCare in partnership with InVentry can bring the sign in process into the digital age. Registers and late slips are on the system that can easily be accessed, and visitors are provided with photographic ID labels quickly and easily. By introducing a new electronic visitor management system for schools also increases the level of security. When parents are choosing a school, the top priority is whether their child will be safe. InVentry are aware that this is a high priority, which is why they have put so much work into perfecting their data security and sign in protocols. InVentry is a well-known and trusted system, parents know that their children are in the most capable hands. Visitor Sign in and Phone ID badge printing – Visitor management systems for schools can sign in almost instantly and print a photo ID badge. Fully Encrypted Database – Keeping your data secure. DBS Check Integration – Disclosure and Barring Service checks a person’s criminal record. Quick Find and Visitor Memory – The fast and efficient system allows regular visitors and staff to select who they are by just typing a few characters. Staff Notification – This system allows members of staff to be notified as soon as their selected guest has arrived on site thanks to the InVentry central database. Easy Sign In & Out – When signing in or out of the premises, visitors, students and staff members can simply find their photo on the system or scan their unique barcode which avoids the need to scroll through a long list of names. One-Click Fire Evacuation list – The visitor management systems for schools can instantly produce a full list of visitors, staff and students onsite, this is a great feature for fire evacuation purposes or for school reference. Time Card Printing – This feature is great for employees such as cleaners or lunchtime supervisors, as it can produce time cards to help the school business manager monitor part time staff hours. This visitor management systems for schools is compatible with most management information systems (MIS) which gives school reception staff full control over who is entering and leaving your school. Contact us today to arrange an onsite demonstration of the InVentry Visitor Management System.